Spectra: Spectroscopy indicating that TCP J18102829-2729590 is a classical nova in the early optically thick stage was obtained 2016 Oct. 20 UT by P. Lukas (International Centre for Radio Astronomy Research, Univ. Western Australia; ARAS Group) (ATel #9658; note that the date is given there as Oct 10.24, but the spectrum image shows Oct. 20). His spectrum, uncorrected for instrument response, may be seen at https:://groups.yahoo.com/neo/groups/spectro-l/conversations/messages/18546. Charts: Charts with a comparison star sequence for TCP J18102829-2729590 may be created using the AAVSO Variable Star Plotter (VSP). Be sure to include the spaces in the name as shown. Submit observations: Please submit observations to the AAVSO International Database using the name TCP J18102829-2729590. Be sure to include spaces in name as shown. Once a name is announced in a CBAT IAU Circular, please use that name. a. Announced in IAU Central Bureau for Astronomical Telegrams Central Bureau Electronic Telegram 4332 (Daniel W. E. Green, ed.). Designated TCP J18102829-2729590 when posted to the IAU CBAT Transient Object Confirmation Page (TOCP) at http://www.cbat.eps.harvard.edu/unconf/tocp.html. Much of the information in this Alert Notice is taken from CBET 4332, the TOCP page, or ATel #9658 (http://www.astronomerstelegram.org/?read=9658). 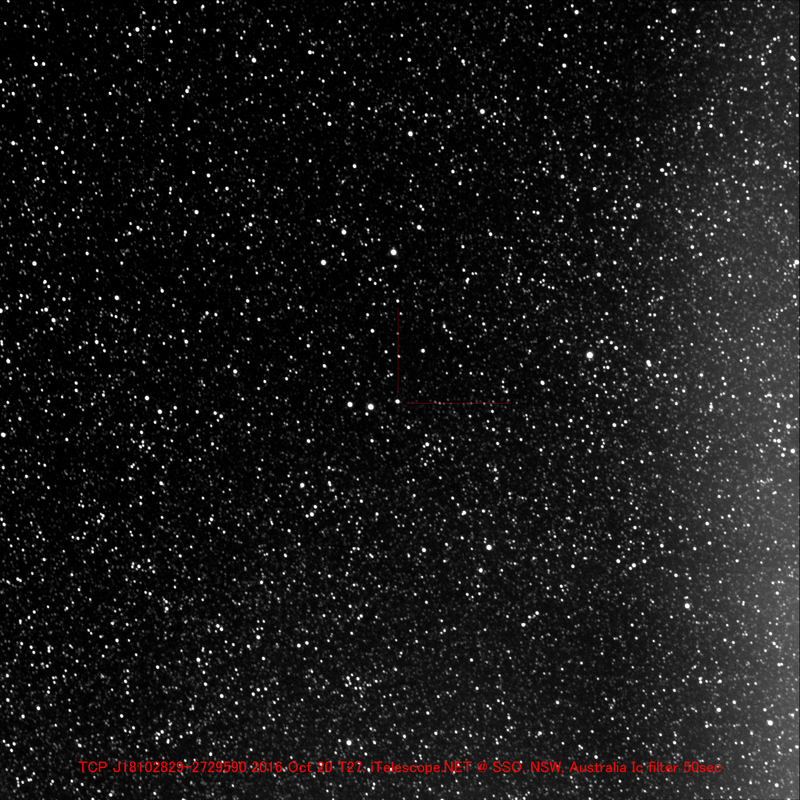 b. K. Itagaki used a 0.60-m f/5.7 reflector to confirm the object immediately after taking the discovery image. c. P. Schmeer (Bischmisheim, Germany) reports that there are two Initial Gaia Source List stars (of 20 mag) less than 1" from the reported position of the nova. Congratulations to Koichi Itagaki on his latest discovery!